Kadambathur Panchayat Union situated in Thiruvallur District of Tamilnadu, India. This region is known as Tondai Nadu or Tondai Mandalam. 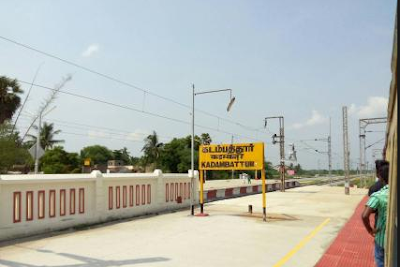 Kadambathur located on the Thiruvallur - Kancheepuram main district road (MDR) surrounded by already developed residential areas of Agaram & Kasavanallathur Village and Venmanambathur villages of Kadambathur Panchayat, Thiruvallur Taluk & District. It is also strategically located between Chennai-Bangalore NH4 (17 Km) and Chennai-Thirupathi NH 205 (6 Km). It is ideally located about 50 Km from Chennai Koyambedu circle (75 Min drive), 8 Km from Thiruvallur and just 1.25 Km from Kadambathur railway station.The Chennai - Arakkonam Suburban train service provides excellent connectivity (60 Min travel from Chennai Central). Located very near to chennai approx 45kms from chennai Central railway station(40 min travel) It is also strategically located between Chennai-Bangalore NH4 (17 Km) and Chennai-Thirupathi NH 205 (6 Km). It is ideally located about 50 Km from Chennai Koyambedu circle (75 Min drive), 8 Km from Thiruvallur The Chennai - Arakkonam Suburban train service provides excellent connectivity (45 Min travel from Chennai Central).